...Especially if its a FLEETWOOD MAC! Its always gratifying to see a wide range of people at a live gig covering the very best & worst that humanity can offer. From the boomers singing along to the hits,to the yobs-well, just being yobs!, the hard-core music fans, live gigs attract so many, from places so far away. Thankfully though, where we (Mike, Johnny & myself) were 'parked', there weren't too many dickheads nearby to ruin the evening. So, having nabbed what seemed like a good location, we cracked open a refreshing ale, assumed a relaxed pose, and let the band take us on a trip to musical nirvana! Now, call me a purist-or a die-hard, but I enjoy live gigs for one main reason; to see 'professional musicians' strut their stuff. I just really get off on watching these consummate pros make musical magic. Its the trademark of all truly great modern bands to be able to deliver concert after concert-for decades in some cases-that set them well apart from all the other poseurs. Cutting it live is the only true way to cement your bands legacy into the hearts & minds of your followers. So, can the Mac still 'cut it' after all these years? Hell yeah! - and then some. Perhaps this gig was best summed up by Lindsay Buckingham on Sunday night, when he said that this gig was one his top 5-this year, if not his whole career. High praise from someone who has done many top notch gigs in his lifetime. Reflecting back on this show, I'd say I'd have to damn well agree with his sentiments. The band were on fire from the first song "Monday Morning" till the last song in the 2nd encore. Mick Fleetwood is still a towering presence at the back-providing a solid-but subtle foundation with John McVie on Bass. McVie is your typical stoic strong but silent type, never stepping out into the spotlight, content to anchor the proceedings with nicely understated bass lines & riffs that drive the songs-rather than overwhelming them with fiddly bits; like Entwhistle in The WHO! This venerable pairing have now been playing together for 43 years as the rhythm section in the Mac. That is cause for wonder and astonishment that two muso's still feel compelled to create music together. Long may they continue. 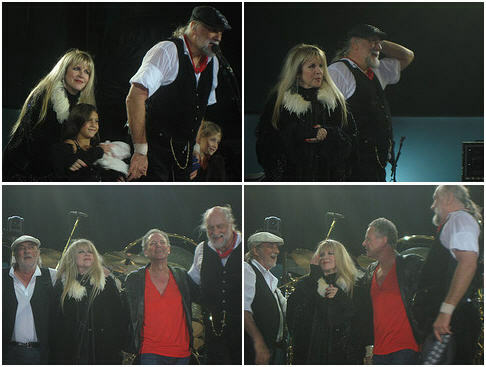 In complete contrast to the engine room, up front its still the Buckingham & Nicks show. On stage left, we have the still glamorous Stevie Nicks, singing with her trademark raspy, achingly tender voice-still hitting all the right notes, in all the right places. Her stage image is uniquely hers-and hers alone. She may have inspired plenty of imitators-but there's only one original.